Except as set out below, we do not share, sell, or disclose any personal data collected through our website. When you place an order or book a skydive with us, we collect personal data, such as your name and contact details, as necessary to process your request and arrange your skydive. We will send transactional messages via email to acknowledge your request and provide status updates. Gift vouchers and confirmation letters may also be sent by postal mail. If you book a charity skydive, your name and contact details may be given to the charity identified in your booking, so that they may support you with your fundraising efforts and arrange to collect any sponsorship funds. Payment information is never collected or transferred through our website. When you make a payment online, our staff never have access to sensitive payment data or full debit or credit card numbers. At the point of payment, you are transferred to a secure page operated by Barclaycard, PayPal or another reputable payment service provider. That page may be branded to look like a page on our website, but it is not controlled by us. We process information about your debit or credit card or other means of payment when you provide it to us over the phone. We take the following measures to protect your payment information: We keep your payment information encrypted on servers operated by our bank or payment service provider; access to our payment system is restricted to authorised staff only; and we only show partial detail, such as four digits of the debit or credit card number, to identify the means of payment. When you attend the airfield for your skydive, you will be required to submit your completed BPA membership form. Your personal data and information pertaining to insurance will be passed to our governing body, the British Parachute Association. Skydiving is a social sport and images of the activity are commonly published. We reserve the right to use any video and photos of you at the airfield on our website, social media profiles and printed promotional materials. If you do not wish to be included please contact us at https://skydivenorthwest.co.uk/contact-us/. When you contact us, whether by phone, email or through our website, we collect the data you provide in order to reply with the information you need. We record your request and our reply in order to increase the efficiency of our service. We keep personally identifiable information associated with your message, such as your name and email address, so as to be able to track our communications with you to provide a high-quality service. Our website may allow you to post information with a view to that information being viewed, copied, downloaded, or used by other people. Examples include: making public posts or comments; posting or tagging images; and leaving ratings, reviews or feedback. In posting personal data, it is up to you to satisfy yourself about the privacy level of every person who might use it. We store this information, and we reserve a right to use it in the future in any way we decide. Once your information is publicly posted, we have no control over what any individual third party may do with it. We accept no responsibility for their actions at any time. We may moderate or control what is posted, but we are not always able to do so as soon as content is published. Provided your request is reasonable and there is no legal basis for us to retain it, then at our discretion we may agree to your request to delete personal data that you have posted. You can make a request by contacting us at https://skydivenorthwest.co.uk/contact-us/. When we receive a complaint, we record all the information you have given to us. We use that information to resolve your complaint and assess the level of service we provide. If your complaint reasonably requires us to contact some other person, we may decide to disclose information to that other person. Cookies are small pieces of text that are stored by your web browser or device when you visit a website. They allow a website to remember you or your preferences. This allows the website to provide you with a personalised experience and the website owner with statistics about how you use the website so that it can be improved. Some cookies may last for a short period of time, such as one day or until you close your browser. Others last for a longer period of time or indefinitely. Your web browser should allow you to delete any you choose. It also should allow you to prevent or limit their use. Requests by your web browser to our servers for web pages and other resources on our website are logged. We record information such as your internet connection IP address, browser type, device type, software version and configuration. We use this information in aggregate to assess the popularity of the web pages on our website and how our site performs. If combined with other information we know about you from previous visits, the data possibly could be used to identify you personally, even if you are not signed in to our website. We use Google Analytics to collect information about how our website performs and how visitors, in general, use our site. This helps us evaluate use of our website; compile statistical reports on activity; and improve our content and website performance. Google Analytics gathers certain simple information over time, such as your IP address, browser type, internet service provider, referring and exit pages, time stamp, and similar data about your use of our site. Google provides further information about its own privacy practices and offers a browser add-on to opt out of Google Analytics. Re-marketing involves setting a cookie when you browse our website in order to be able to show sponsored messages or ads about our skydive services when you visit some other websites. We may use online re-marketing services from time to time. If so, if you haven’t rejected or deleted the cookie(s), then you may see advertisements for our skydive services on other websites. Our website may include resources or functionality from other online services, such as social media platforms, video sharing services and other websites. These online services, their agents or vendors may use technology that automatically collects information about you or your device when their resources are linked or displayed on our website. They may also use other technology such as cookies to personalise the content of, and to measure the performance of their resources. Your information and personal data may be processed by our contractors and service providers who help provide or improve our services. Our service providers perform services such as payment processing, web hosting, application platforms, analytics and other similar services. We may sometimes receive information that includes personal data from third parties whose services we use. Although we are located in the United Kingdom, the internet is global and data may be processed in other countries. Accordingly, data obtained within the UK or any other country may be processed outside the EU. For example, some of our service providers process data in the United States. We use safeguards with respect to data transferred outside the EU, such as the EU-US Privacy Shield Framework and data protection clauses in our contracts with data processors that include transfer clauses written by or approved by a supervisory authority in the EU. We process your personal data under one or more relevant legal grounds. If a basis changes then if required by law we shall notify you of the change and of any new basis under which we have determined that we can continue to process your information. When you book a skydive, buy a skydive voucher from us, or otherwise agree to our terms and conditions, a contract is formed between you and us. In order to carry out our obligations under that contract we must process the information you give us. Some of this information may be personal data. We may use it in order to: verify your identity for security purposes; sell products to you; provide you with our services; provide you with suggestions and advice on skydiving and how to get the most from our services. We process this information on the basis there is a contract between us, or that you have requested we use the information before we enter into a legal contract. Additionally, we may aggregate this information in a general way and use it to provide class information, for example to monitor our performance. If we use it for this purpose, you as an individual will not be personally identifiable. We shall continue to process information on this basis until the contract between us ends or is terminated by either party under the terms of the contract. 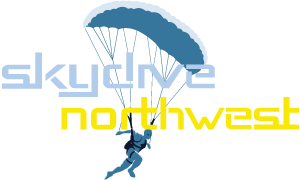 Through certain actions when otherwise there is no contractual relationship between us, such as when you ask us to provide you more information about Skydive Northwest and our services, you provide your consent to us to process information that may be personal data. Wherever possible, we aim to obtain your explicit consent to process this information. Sometimes you might give your consent implicitly, such as when you send us a message by email to which you would reasonably expect us to reply. Except where you have consented to our use of your information for a specific purpose, we do not use your information on this basis in any way that would identify you personally. We may aggregate it in a general way and use it to provide class information, for example to monitor the performance of a particular page on our website. We continue to process your information on this basis until you withdraw your consent or it can be reasonably assumed that your consent no longer exists. You may withdraw your consent at any time by instructing us at https://skydivenorthwest.co.uk/contact-us/. However, if you do so, you may not be able to use our website or our services further. We may process information on the basis there is a legitimate interest, either to us or another party, of doing so. Where we process your information on this basis, we do so after having given careful consideration to: whether the same objective could be achieved through other means; whether processing (or not processing) might cause you harm; whether you would expect us to process your data, and whether it would generally be considered reasonable to do so. For example, we may process your data on this basis for the purposes of: record-keeping for the proper and necessary administration of our business; responding to communication from you to which we believe you would expect a response; protecting and asserting the legal rights of any party; insuring against or obtaining professional advice that is required to manage risk; protecting your interests where we believe we have a duty to do so. Sometimes, we must process your information or personal data, in order to comply with a statutory or legal obligation. For example, we may be required to give information to legal authorities if they so request or if they have the proper authorisation such as a search warrant or court order. In this document, “we”, “our”, or “us” means North West Parachute Centre Ltd t/a Skydive Northwest. We are company number 05659581 registered in England. Our registered office is at Shorrock House, 1 Faraday Court, Fulwood, Preston, Lancashire PR2 9NB. Under data protection laws you have rights in relation to your personal data that include the rights: to access your personal data; to have your personal data rectified if it is inaccurate or incomplete; to erasure of your personal data in some circumstances; to restrict processing of your personal data in some circumstances; to withdraw consent for processing on the basis of consent; to object to processing on the basis of legitimate interests; and to portability of your personal data. You may review or update your personal information by signing in to your account on our website. To obtain a copy of any information that is not provided on our website, you may send us a request at https://skydivenorthwest.co.uk/contact-us/. After receiving the request, we will tell you when we expect to provide you with the information, and whether we require any fee for providing it to you. To exercise any of the rights set out above, you may send us a request at https://skydivenorthwest.co.uk/contact-us/. This may limit the service we can provide to you. You can learn more about your rights and our data protection obligations by reading the information provided at https://ico.org.uk/for-organisations/guide-to-the-general-data-protection-regulation-gdpr/individual-rights/. If you are not happy with our privacy practices or if have any complaint then you should contact us at https://skydivenorthwest.co.uk/contact-us/. If a dispute is not settled then we hope you will agree to attempt to resolve it by engaging in good faith with us in a process of mediation or arbitration. If you are in any way dissatisfied about how we process your personal data, you have a right to lodge a complaint with the Information Commissioner’s Office. This can be done at https://ico.org.uk/concerns/. Except as otherwise mentioned in this privacy notice, we keep your personal data only for as long as required by us: to provide you with the services you have requested; to comply with other law, including for the period demanded by tax authorities; to support a claim or defence in court. We may update this privacy notice from time to time as necessary. The terms that apply to you are those posted here on our website on the day you use our website. You may save or print a copy for your records.